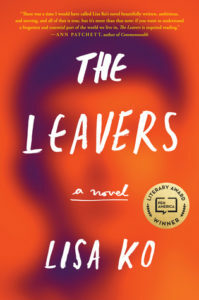 Lisa Ko’s novel The Leavers couldn’t be more timely. It’s a cautionary tale about the dangers of cruel and inhumane immigration policies and the effect they have on families for years to come. Deming is an 11-year old boy who grows up in the Bronx with his Chinese immigrant mother, Polly. One day, she disappears from her job at a nail salon, leaving him in the hands of her boyfriend Leon, Leon’s sister Vivian and Vivian’s son Michael, with whom they had lived. Months go by, and Deming never loses faith that his mother will come back for him, even as they receive no word as to where she is. Finally, Deming is put up for adoption by Vivian, who can no longer afford to care for him. He is adopted by a childless white couple in upstate New York and renamed Daniel. When The Leavers opens, Daniel is flailing. He has been kicked out of college after his gambling addiction is discovered, and he has moved to New York City to pursue music, his true passion. But he can’t stick with anything – the band he has joined with his best friend from upstate or his half-hearted attempts to transfer to a new college at his parents’ urging – until he receives an email out of the blue from Michael that sparks his journey to find out finally what happened to his mother. The Leavers came very highly recommended and there is a lot to like about it. Deming and Polly are both deeply flawed, yet deeply sympathetic. Daniel is a frustrating character in many ways – his self-absorption and lack of consideration for those who care about him as well as his self-destructive tendencies – but it’s also quite understandable how the abandonment and cultural whiplash he experienced as a pre-teen would have made him so. Polly’s side of the story unspools slowly throughout the book, until you get a clear picture of what happened to her and why. She’s not perfect, but her love for her son turns out not to have been in question. There is a coldness that permeates The Leavers that kept me from falling in love with it. I liked it quite a bit, but I couldn’t quite connect with it, perhaps because Daniel and Polly were both rather emotionally remote. I do recommend it for its honest look at the painful reality of our draconian immigration policies – Ko based the fact pattern for The Leavers on a true story from 2009 about a Chinese immigrant – and I thought it addressed cross-cultural adoption pretty well (though Daniel’s adoptive parents seemed particularly clueless). In the end, I admired the book but didn’t love it as much as others have. Some of the story seemed unrealistic, especially as Daniel goes in search of his mother, as characters didn’t react as I expected they would and so much seemed to go unsaid. I do recommend The Leavers based on how well-received it was and how important its themes are today. Posted on January 30, 2018 by gayle. This entry was posted in Fiction and tagged lisa ko, the leavers. Bookmark the permalink. Excellent review, Gayle. I just finished listening to the audio yesterday. I agree with your sentiments. I liked the book a lot, but I also felt that something kept me from loving it. It seemed too long to me, although I think the print is about 350 pages, so I’m not sure why the audio seemed so long. I felt like the book could have gotten to the unraveling sooner, and been a bit crisper. I did like many of the characters quite a bit, especially Deming/Daniel and Leon. I found Polly to be too idiosyncratic to relate to, even when the horror of her story became clear. I did find Ko’s descriptions of the various locations in the book to be excellent, especially her depictions of NYC. As you say, it’s an important book, so I would recommend it, even though I didn’t necessarily find it a highly enjoyable read. I liked the way the two mothers — Polly and Kay — were described as admirable and likeable mothers, yet in completely different ways. “The Leavers” is a sad book; I find myself fairly melancholy having just finished it. I liked Deming so much, yet didn’t necessarily have a lot of optimism that he would ever feel genuinely settled and happy. This is on my TBR list. I recommend that you read Exit West by Mohsin Hamid which not only is an excellent read but also sheds light on the immigration/refugee problem in our world today. I’m torn- part of me wants to read something timely on this important subject but not being able to connect with the characters sounds a bit off-putting. I appreciate your honesty about this trait in the book and am going to trust you and add it to my TBR. Thank you!